Picked this car up a little over a year ago. It sat in the backyard until December 2017, then I moved it into the shop to get started on it. These first few pics are from when I first brought it home. I got the motor running in the car, barely. But it had very low compression on one of the cylinders. So I pulled it out to rebuild it. Once I got the engine torn down, I found out the L16 pistons were in pretty poor shape and were unusable. I ended up getting an L18 bottom end from the guy I bought the car from and built it instead. The block after getting it back from the machine shop. They honed the cylinders, surfaced the deck and installed new freeze plugs. Then I finally hauled it to my dad's shop where I could really tear into the car. Before I removed everything else from the engine bay. Going to sandblast and paint it. Then the "well I might as well do this too" part happens. Took the fenders off so I can sandblast and paint the front fender wells. Sandblasted the engine bay, front fender wells, backside of the fenders, bottom of the hood, floorpans, and inside the trunk. That's pretty much where it stands at the moment. 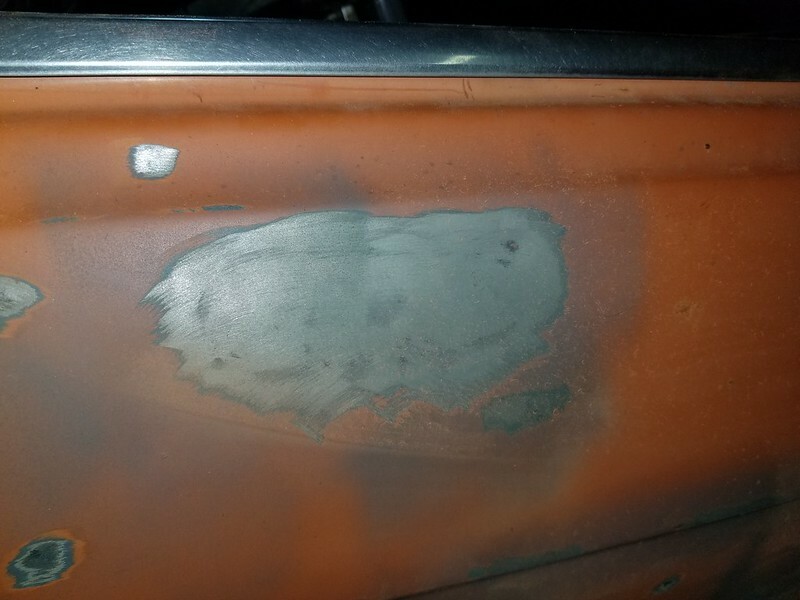 I sprayed self etching primer on all the bare metal, just to cover it up. 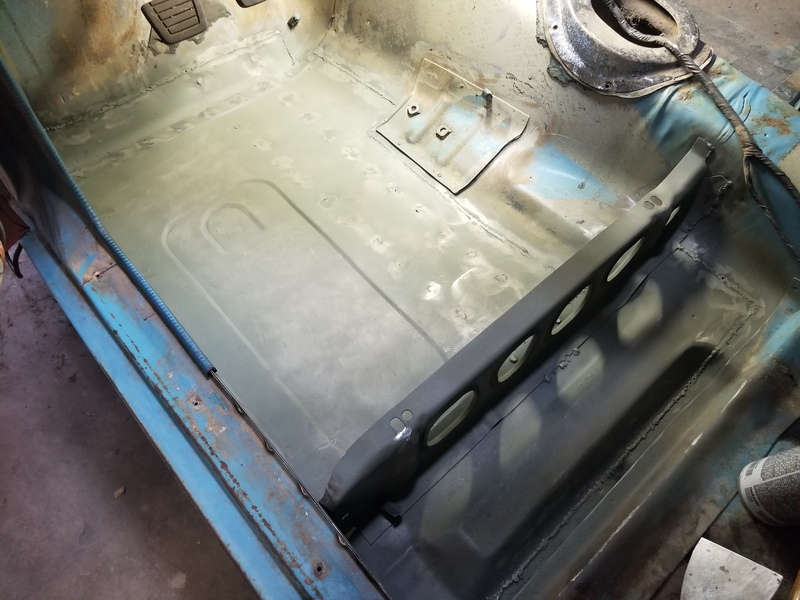 Next step is trimming the new floorpans to fit and welding them in. wow what a great starting point! I like the block colour is that blasted steel or paint ? You weren't kidding about tearing into it, good you have a shop environment. What kind of fuel pump is that? Is that a 64 gto ? RMS wrote: wow what a great starting point! I like the block colour is that blasted steel or paint ? The first picture of it is just the bare cast iron block after being cleaned at the machine shop. But yeah, I liked the color so much I bought some cast iron color engine paint and painted it. two_68_510s wrote: You weren't kidding about tearing into it, good you have a shop environment. Original plan was to just repair the rust and get it running and driving and enjoy for a bit, but things escalated, as they usually do. 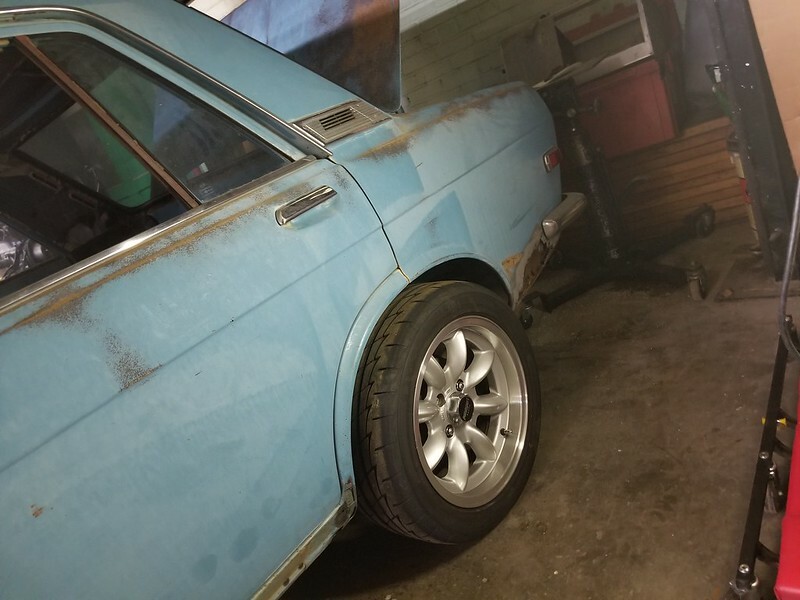 I do plan to leave the outside paint/patina like it is for a while though...except maybe that orange door. Then down the road I'll do a full paint job and interior. iceD wrote: What kind of fuel pump is that? Stock mechanical style pump, don't recall the exact brand, got it from rock auto. NICKLE&DIME wrote: Is that a 64 gto ? New passenger floor going in.. 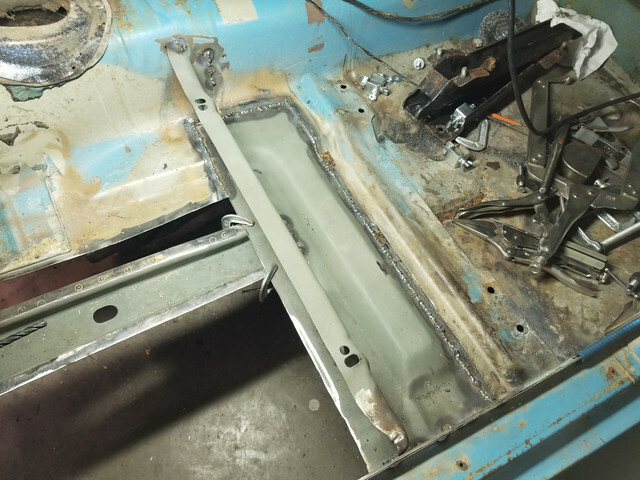 The driver rocker before and after..
Cut out more of the rusted floor and prepped the donor floor/seat brace to go in. Also, when I cut the old inner rocker out, I cut it slightly too far back (about a 1/4") and the new rocker was too short to fill it, so I cut out a couple more inches, made and beadrolled a new short piece and welded it in. The rest of the inner rocker is now ready to be put in. Then the driver floor. I had cut out the battery tray with the intention of moving the battery to the trunk, primarily to clean up the engine bay a bit. 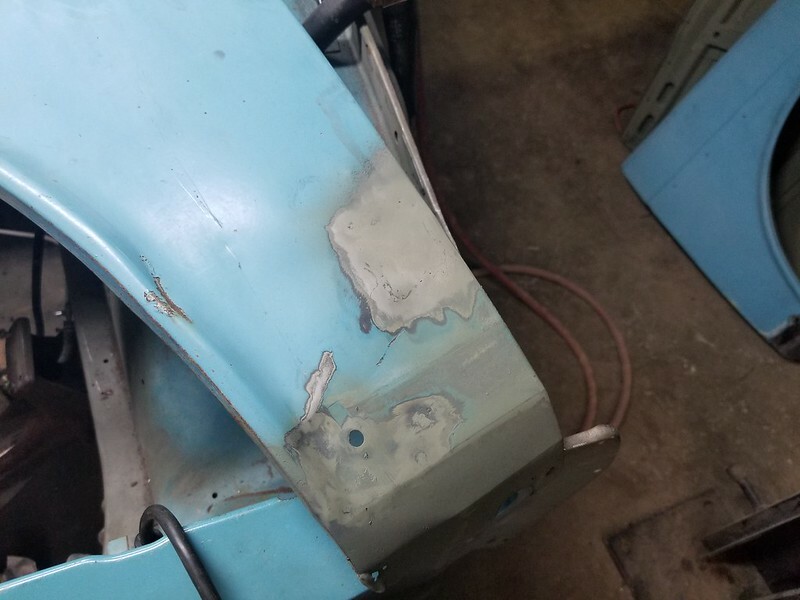 Decided to get of the indention in the inner fender. New piece welded in, not cleaned up yet. 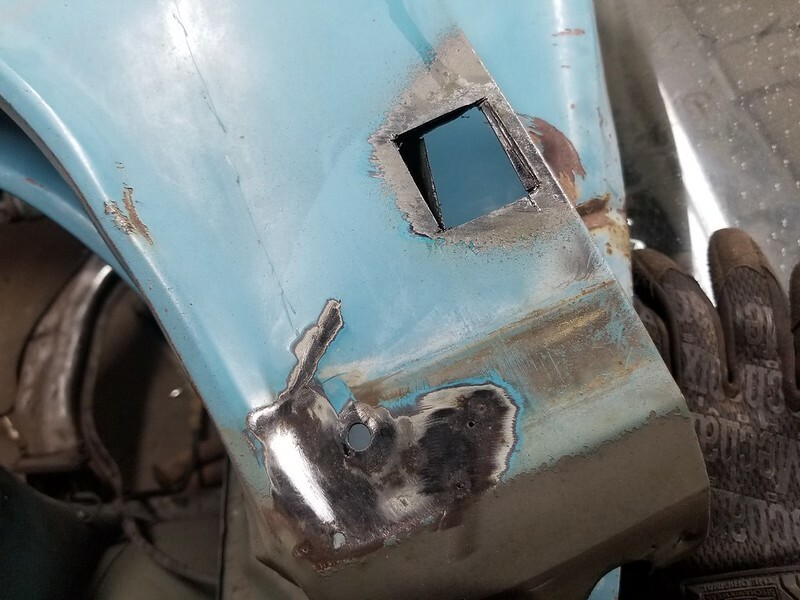 Filled the heater core holes in the firewall. Will ultimately go with a vintage air system down the road. Finally had some time to work on the car. 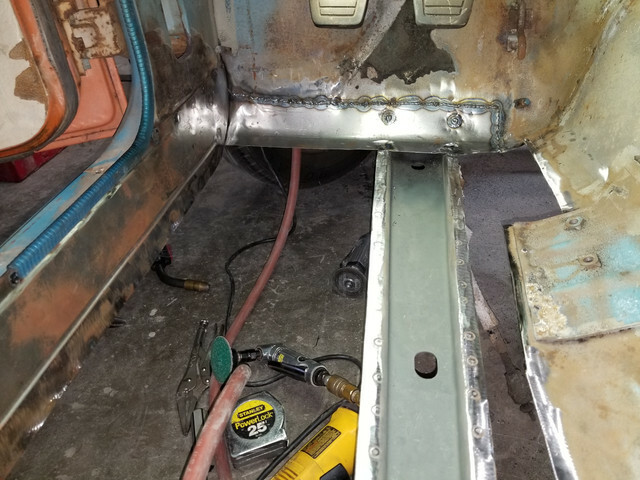 Got the inner rocker in, the toe kick, and part of the floor/seat brace. Good call, they make nice stuff and even though it's process to fit everything in the car it'll be worth it. Nice work man! 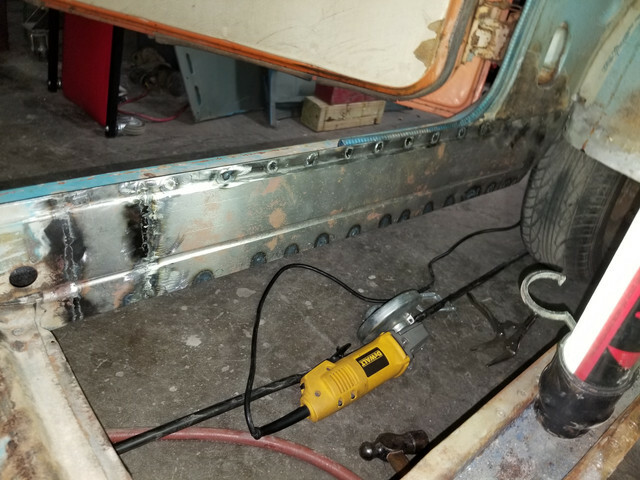 Driver side floor welded in. Nice work, thanks for the detailed write up, very useful. Out of curiosity, I took one of the 16x7 Panasports off of my Z and threw on the 510 to see how they fit. Tires are 205/50/16. I think they are zero offset wheels but they poke out a little more than I thought they would. 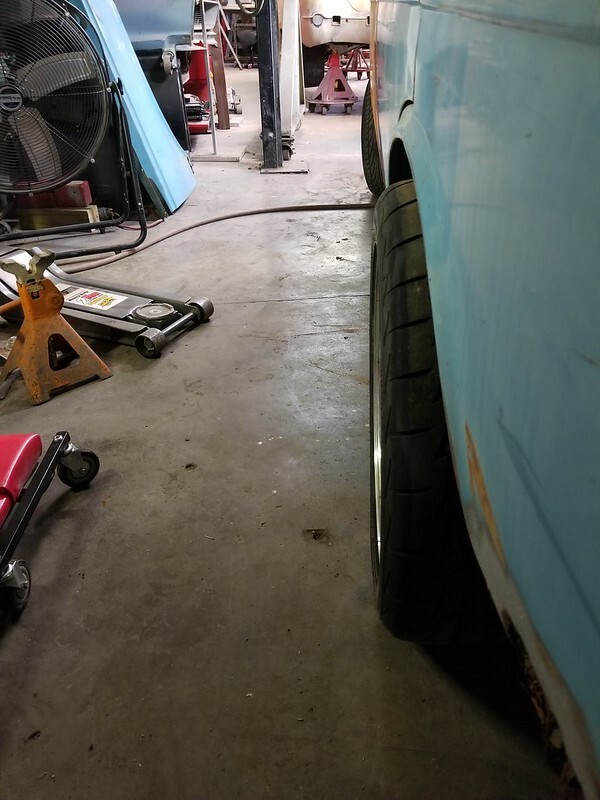 I know when I lower it, the rear will gain more negative camber, but still looks like they will rub. I was hoping to run them for a bit as they have new tires on them and the Z is in storage, but now I'm not so sure.